Incarnate Word Academy maintains a code of dress and grooming consistent with its character as a private, Catholic, college-preparatory school. This code contributes to a seriousness of purpose, a constructive learning atmosphere, and the development of sound personal habits and a positive self-image. To teach the total child, teachers and administrators will instruct students with regards to proper and acceptable dressing and grooming habits. This is to include stressing neatness, cleanliness, acceptability, and appropriateness. Students should be dressed in such a manner that instruction is enhanced and not hindered. Neatness, cleanliness, and appropriateness are to be the guiding factors. The entire staff will enforce the dress code. Violations of any of the policies listed herein will result in disciplinary action and/or being sent home. Students are expected to be in proper attire when they arrive on the campus. Parents are expected to support this policy by ensuring that their children wear only the approved school attire. Click here to download the 2018-2019 Elementary Level Dress Code and Grooming Regulations. *You can earn a 3% rebate for the school on everything you buy from the Lands' End uniform catalog. IWA Elementary Level's ID number is 9000-9990-4. All students are required to attend class in proper uniform. Uniforms are to be purchased from Academic Outfitters and/or Lands’ End. Upon occasion, parents may happen on clothing of the same style, color, etc. at another retail store that is more feasible/affordable for them. Any school apparel of regulation style and color should be presented to the administration for review prior to applying the school logo. If school apparel is acceptable, it can be embroidered locally. Parents are asked to ensure that clothing is kept clean and presentable, replacing faded and tattered clothing when needed. Gently used uniforms will be available for reduced price during Angel Check-In. All girls will wear the regulation red polo shirt with the IWA logo. IWA blue and red plaid skirt, shorts, or long pants – skirts and shorts should extend to at least the top of the knee; all girls should have at least one skirt for weekly Mass and formal, school-wide events. Solid white crew socks that measure at least 2” above the ankle bone (including bobby socks edged with solid red or navy or IWA plaid) or knee socks. Footwear: solid white, solid black, or a combination of white and black athletic shoes with white or black shoelaces (Montessori Primary and Traditional Pre-K and Kindergarten students may wear shoes with Velcro until they can tie their shoes) - no other colors (not even on the logo) are permitted. Wheels, lights, sounds, or any other add-on's are not allowed. Only solid white, short-sleeved or sleeveless undershirts or undergarments are acceptable. Red, navy, or white shorts may be worn under skirts. If the weather extends below 60 degrees, navy, white, or red full-length leggings or tights may be worn. sweatpants and knee-high leggings are unacceptable. Navy or red IWA sweatshirts and/or solid navy, red, or white sweaters or sweatshirts. grey IWA sweatshirts, when designated by the athletic coaches, may also be worn. Modest hair accessories in combinations of red, navy, and white. Religious medals and single post earrings only - one single post earring may be worn per ear. No make-up or colored nail polish may be worn; clear nail polish and lip balms are acceptable. nails should be kept short and neatly trimmed. Solid red, white or blue sweaters or jackets may be worn inside the classroom. *When the weather dips below 40 degrees, coats, hats, scarves, and/or gloves, any color, are acceptable for use outside. Khaki regulation pants or walking shorts (our Montessori Primary and Traditional Pre-K and Kindergarten may wear shorts with an elastic waistband with no belt). All boys should have at least one pair of long pants for formal, school-wide events. Solid white crew socks that measure at least 2” above the ankle bone. Footwear: solid white, solid black, or a combination of white and black athletic shoes with white or black shoelaces (Montessori Primary and Traditional Pre-K and Kindergarten students may wear shoes with Velcro until they can tie their shoes) – no other colors (not even on the logo) are permitted. wheels, lights, sounds, or any other add-on's are not allowed. Only solid white, short-sleeved or sleeveless undershirts are acceptable. Compression shirts and leggings are not acceptable. Religious medals may be worn. Hair should be well-groomed and trimmed above the shirt collar and eyebrows. All students may wear IWA red spirit shirts or school-sponsored event shirts (like Fall Fun Night). Regular, plain-fit (not skinny), non-faded, non-ripped, non-decorated BLUE jeans. Montessori Primary ages 3-5 and Traditional Pre-K and Kindergarten students may wear blue jean shorts or skirts. Uniform tennis shoes and socks. The regular school uniform will be worn on all early dismissal days unless the early dismissal day is a Friday. Students shall be in compliance with the dress code prior to arrival at school. For any dress code violation a student may be sent to the office. Parent/guardian will be notified and will have to bring their student the appropriate clothing if necessary. Parents are asked to ensure clothing is kept clean and presentable, replacing faded and tattered clothing when needed. Click here to download the 2018-2019 Middle Level Dress Code and Grooming Regulations. *You can earn a 3% rebate for the school on everything you buy from the Lands' End uniform catalog. IWA Middle Level's ID number is 9001-2798-6. Approved school attire must be worn to all school functions, unless otherwise directed by those in charge of the particular events (e.g. socials, meetings, games). The dress code is intended to provide an atmosphere conducive to learning. Throughout the day, faculty and staff check that students are in compliance with the dress code. Violation of the dress code may result in disciplinary action and require the parent to take proper clothing to IWA. Clothing should have no logos or labels other than the approved IWA logos. Pants/jeans may not be cut at the seam/s or frayed in any way. Clothing that is NOT allowed includes shorts (including Bermuda shorts), cargo pants, low-rise pants, stretch or tight (skinny) jeans, baggy pants, faded jeans, ripped or torn jeans, and other clothing items that are not listed but are deemed inappropriate by the administration. Boots may be worn only with administrative permission on cold weather days. Plaid skirt, as approved by IWA. The plaid culottes skirt may not be worn. The length of the skirt must be NO HIGHER THAN THE TOP OF THE KNEECAP. The skirt’s waistband must be visible and at the natural waist. Solid red, white, or navy polo-style shirt with the traditional logo. If worn, only a solid white undershirt is permitted. Solid white socks that measure at least 2” above the ankle bone, “Bobby” socks, crew socks, or knee-high socks. Solid black or solid dark brown leather or faux-leather closed-toe flat shoes. Shoes made of canvas or cloth are not permitted. Plaid skirt (see Girl’s Daily-wear Uniform). The plaid culottes skirt may not be worn. Solid white button-down oxford blouse with the traditional logo. Blouse must be tucked in at all times. Long-sleeves must be kept extended to the wrist and buttoned. Red hair accessory at least ½” wide, such as a lengthy ribbon, a headband, a bow, etc. Khaki pants (no other color). No pants made of denim fabric. The pants’ waistband must be visible and at the natural waist. Solid brown or black belt with a small buckle. The shirt must be tucked in at all times. Only a solid white undershirt is permitted. Solid white socks that measure at least 2” above the ankle bone or white crew socks. Solid black or solid dark brown leather or faux-leather closed-toe flat shoes. Shoes made of canvas or cloth are not allowed. Solid navy pants. No pants made of denim fabric. Solid white button-down oxford shirt with the traditional logo. Shirt must be tucked in at all times. Solid RED tie, as approved by the administration. Only red school-spirit T-shirt, with athletic logo. Regular, classic, non-faded, non-decorated, non-ripped blue jeans with pockets. NO “SKINNY” JEANS. NO TIGHT JEANS. BOOT-CUT JEANS ARE RECOMMENDED FOR GIRLS. Solid brown or black belt with a small buckle—no spikes or other ornaments on the belt. On days when the anticipated high temperature will be 40 degrees. Hooded jackets of any type are not allowed in the classroom, even if they have the IWA logo. IWA red and white zippered windsuit jacket with the sport logo. Solid red sweater or jacket that has only the IWA logo; no other logos or designs of any kind/size are allowed. Unless otherwise designated, jeans may be worn ONLY on days when the anticipated high temperature will be below 40 degrees. The regularly scheduled shirt for that day will be worn. Solid dark blue or solid black ankle-length leggings or tights may be worn ONLY on days when the predicted high temperature will be below 40 degrees. The student may wear a solid dark red, white, or dark blue long-sleeve undershirt. 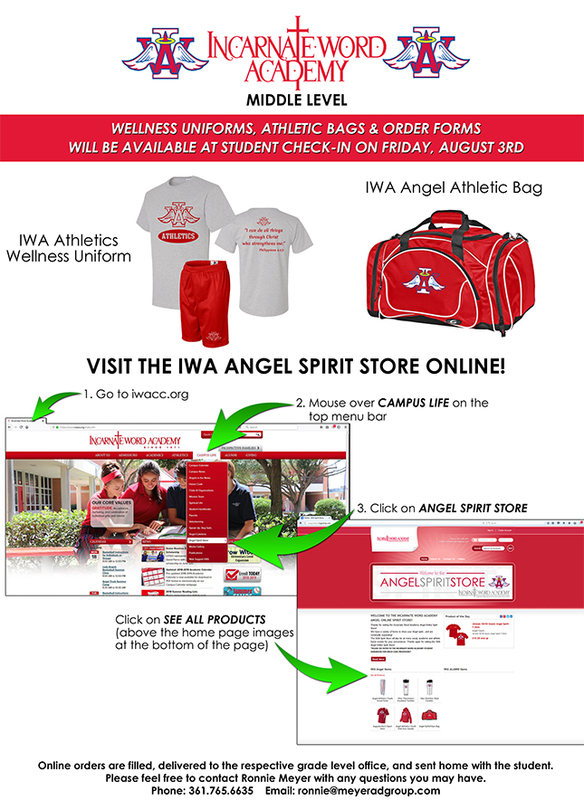 IWA Middle Level uniform clothing may be worn, as directed in the handbook. No skinny jeans; no tight-fitting jeans. Clothes should be neat, modest, and tasteful. Shirts / blouses must fit properly; they must not be oversized or tight fitting. Shirts / blouses / dresses must have sleeves. Cap-sleeves, tank tops, halter tops, spaghetti straps, or sleeves with cut-out openings may be worn only under a jacket, shrug, or other acceptable outer layer. Full-length jeans, slacks, or Capri pants (mid-calf) are permitted. Jean / pant legs may not be rolled to create a cuff. Only regular, classic, non-faded, blue jeans with pockets may be worn on approved days and to approved events. Shoes must be worn at all times. Exceptions are allowed only with administrative permission. Shirt and blouse long sleeves must not be rolled up or tucked under. Only solid white t-shirts may be worn under uniformclothing. Only spirit t-shirts are allowed, and only on specific days. Wellness shorts are allowed, and only in wellness classes or athletic events. The midriff must always be covered by clothing. Modest dresses and blouses without low necklines may be worn. Sheer fabric clothing is not allowed without appropriate lingerie worn underneath. Only clothing that is not torn, tattered, faded, or shows excessive wear may be worn. Heels of girl’s shoes must be no more than 1½ inches high, and are to be worn only on special occasions such as to social events, with administrative approval. Clothing with advertising slogans, suggestive or offensive writing, pictures, emblems, or symbols are not allowed. Hair must be neatly groomed. Boy’s hair must be cut so that it is above the shirt collar, above the eyebrows, above and around the ear, and does not cover the ear. Male participants in sports are expected to have hair cut as directed by the athletic department. Any extreme hairdo, including hair coloring, partial shaving, or lining of the head, is not permitted. Girls are allowed to wear only clear nail polish. False nails or eyelashes are not permitted. Earrings are allowed only on females: only one set of identical small stud earrings may be worn, one earring per earlobe. The earring must not reach below the lobe of the ear. No other styles of earrings may be worn. Only two bracelets OR a watch / bracelet combination per wrist are allowed. The bracelets or watch / bracelet combination are not to exceed a total of one inch [1"] in width. Click here to download the 2018-2019 Dress Code and Grooming Regulations. *You can earn a 3% rebate for the school on everything you buy from the Lands' End uniform catalog. IWA High School Level's ID number is 9001-5178-8. Brand logos will not be permitted. The Incarnate Word Academy logo will be mandatory on all polo shirts. Students shall be in compliance with the dress code prior to arrival at school. For any dress code violation a student will be sent to the office, parent/guardian will be notified and will have to bring their student the appropriate clothing if necessary. No student will be allowed to leave campus to go change. No student will be allowed to return to class until he or she is in compliance with dress code. In order to avoid unexcused missed class time; students will be provided a change of clothes until parents can provide students with appropriate change of clothes. A school class roster will be kept at the counter to record and monitor dress code/grooming infractions. After a third dress code infraction, disciplinary action will be taken. Pants and shorts may be purchased through Lands' End. All pants, walking shorts, capris are to be worn at the natural waist with a belt. Bottoms must be a cotton twill fabric in either a Khaki, Navy or Black color. Shorts must be two inches above the knees or longer. If an under shirt or camisole is worn, it must be solid colored. Students shall wear appropriate footwear for protection and hygienic reasons while on school grounds, participating in school activities, or on school transportation. Male students’ hair touching and extending below the eyebrow. Unusual hairstyles such as; Mohawks, hair designs, etc. Students who choose not to participate are to be dressed according to normal dress code. While other regulations may apply on specific dress-down days, students must dress in good taste at all times. Jeans of any color unless otherwise designated. Blue denim jeans are only allowed with an IWA school polo, IWA spirit shirt, IWA sponsored club shirt or IWA sports shirt. Jeans must be full length and appropriately fastened at the waist. Blue Jean Passes require a small contribution which allows a student the privilege of wearing blue denim jeans with any IWA school polo, IWA sponsored club shirt or IWA sports shirt. On Blue Jean pass days, students must purchase and display the official pass, which must be worn prominently on the chest portion of the shirt. Students who choose not to participate are to be dressed according to normal dress code. While other regulations may apply on specific dress-down days, students must dress in good taste at all times. Acceptability of dress on dress down days will be determined by the administration. Clothing that exposes the midriff to any degree at any time, including with arms raises; Clothing that displaying slogans or graphics that are offensive, violent, vulgar, obscene, or inappropriately suggestive; clothing displaying promotions for drugs, tobacco or alcoholic beverage products. Clothing that does not distract, display slogans or graphics that are offensive, violent, vulgar, obscene, or inappropriately suggestive; clothing displaying promotions for drugs, tobacco or alcoholic beverage products is not allowed. The principal will meet with male students to convey attire guidelines for this event. The principal will meet with female students to convey any other attire guidelines for this event. *A picture of the dress may be submitted to an administrator for approval. Dress shoes — NO flip flops. Disclaimer: No student shall wear any garment which includes, but is not limited to, any item that depicts the occult, gang membership, death, suicide, violence, gambling, beer, sexual connotations, tobacco, drugs or alcohol. This includes belts, jackets, buttons, or trademark emblems generally associated with the above. After a third dress code infraction, disciplinary action will be taken. The above is a guideline for students to follow. All possibilities for attire and grooming cannot be covered. Therefore, we encourage students to use good judgment in selecting school attire. The final word in attire and grooming is left to judgment of the administrators.